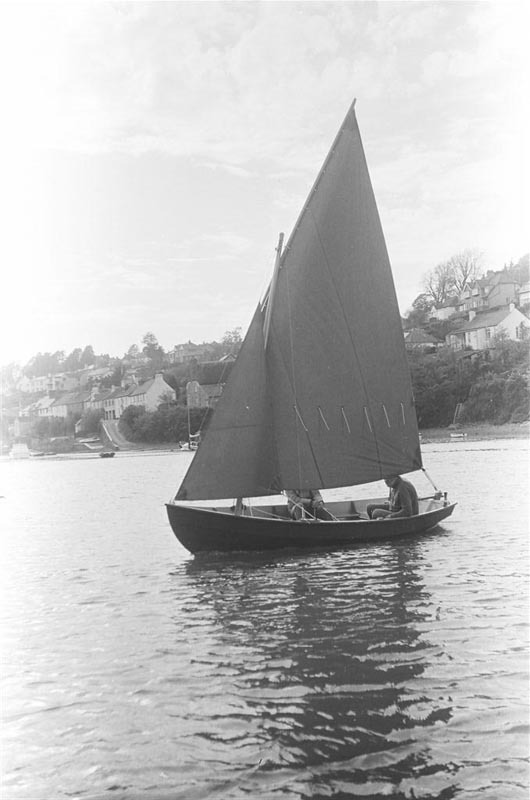 "The best material to use in building a boat is common sense, and she should be well fastened with sincerity"
The Drascombe story starts in the early 1960s with John Watkinson, a former Royal Navy officer, building a boat for himself and his family. John's requirements were for a daysailer, capable of being trailed, stable (to counterract his wife's tendency to seasickness), and safe; but capable of giving an experienced sailor a lively and exciting sail. 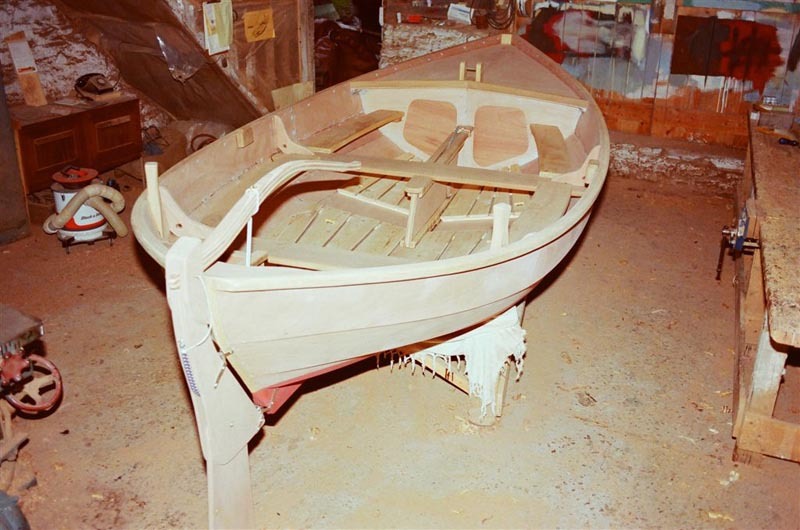 The boat that John hand-built in a barn on his farm at Drascombe Barton was inspired by the working boats of England's North-East coast, which themselves can trace an ancestry back to the Vikings. 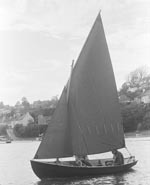 The first Drascombe Lugger was an immediate success and its obvious commercial potential prompted John to initiate production of the boats in GRP. Other models followed, but all following the original philosophy of safety, robustness, and fun. 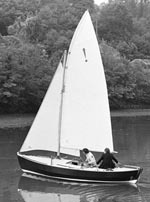 Plans of Drascombe boats for amateur builders have not been available since the death of John Watkinson, the designer, in 1997. Here we give a brief specification of various types of Drascombe. This does not claim to be a complete list. Although most models are or were available in GRP, some types of boat were only ever build in wood. Also included (where available) are pictures of members' boats (click on the thumbnail to see a larger version), and links to comments on the boats from actual owners. In time, we hope to have one of these for each type of boat. A trailer-sailer with a two-berth cabin (and, with the addition of a cockpit tent, room for two more) including cooking and toilet facilities. Replaced the Cruiser Longboat, having a much improved specification, especially with regard to the cockpit and cabin layouts. A Longboat with a cabin. Designed to appeal more to private buyers than the open version, the Cruiser Longboat was introduced and sold side by side with the standard open boat. Introduced in 1970 and replaced in 1979 by the Coaster. Over 400 were built. 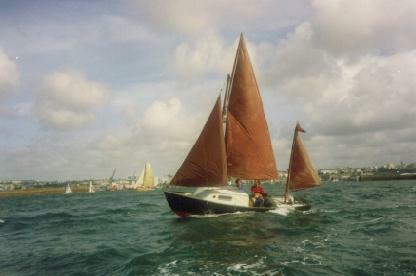 Although smaller than the Lugger, the Dabber carries a full yawl rig on main and mizzen masts. However, the Dabber can easily be distinguished by its bowsprit and transom-hung rudder. A cruising boat with a cabin and choice of outboard well or Sabb inboard diesel. 110 built between 1977 and 1984. This boat now has a new lease of life as the Drifter 22. Churchouse Boats commissioned Paul Fisher of Selway-Fisher to revise and update the original Drifter design & bring it firmly into the trailer-sailer family. The prototype was launched in 2006. She has twin drop keels to achieve both the shallow draft necessary for easy launch & recovery together with the clear cockpit & cabin space of the original boat. Cabin accommodation provides a very large double berth, cooking & toilet facilities. A sprayhood is an integral part of the design. A cockpit tent may be added to increase her practicality at anchor. She is a powerful sailing boat with a deep, comfortable cockpit. An 18' version of the Launch hull with bilge fins for sailing, a Watermota Shrimp inboard engine and a standing lug rig similar to the Dabber. 55 built. 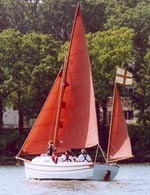 Never intended for the private buyer, the Gig is a pure sail training craft designed for use by Navies. Previously, the Royal Navy used the Montagu Whaler for this purpose, but these boats were getting well past their best, and new ones have not been built since the 1950s. The Longboat was considered too small, so the Gig was designed for this specific market. Based on the Dabber hull and introduced in 1973, the Launch was designed for river and lake fishing. Fitted with a Watermota Shrimp inboard engine and a Dabber mizzen as a steadying sail. Not a very successful model, only 12 being built. Essentially a stretched Lugger, and originally intended as a training craft for sailing schools, Sea Scouts, etc. Centreplate weight is 100 lbs, the Rudder approximately 28 lbs. The boat that started it all, and still immensely popular. The epitome of rugged simplicity, reliability, and seaworthiness in an open boat, the Lugger is equally at home pottering with the kids or undertaking more adventuresome expeditions. A transom version of the Peterboat 4.5m. Only built in wood, not GRP. The Mule is a nice looking small boat ideal for inshore or estuary sailing with quite an acceptable performance, a boat suitable as a day sailer for trailer sailing with a small family, or single handed sailing. In common with the Peterboat 4.5m she has a galvanized pivoting 28lb (13kg) centreplate to add ballast, folding rudder and the rig consists of a simple standing lugsail on a stayed mast in standard guise. There�s the option to add a small jib, a mizzen was not offered as standard with this boat. A small outboard motor to be kept permanently mounted offset on the transom if desired. 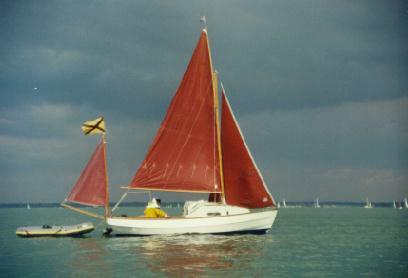 Essentially a development from the Scaith, a double ended open boat, but with a slightly modified hull and rig, very similar in appearance, retaining most of the attributes of the Scaith. The redesign giving it a slightly deeper forefoot and a little fuller aft end with a small skeg. The Peterboat 4.5m is a good looking small boat ideal for inshore or estuary sailing with quite an acceptable performance, a boat suitable as a day sailer for trailer sailing with a small family, or single handed sailing. In common with the Scaith, the Peterboat 4.5m has a galvanized pivoting 28lb (13kg) centreplate to add ballast, a stern hung folding rudder and the rig consists of a simple standing lugsail on a stayed mast in standard guise. Customised options offered a raised foredeck and the mast stepped in a tabernacle. There�s the option to add a small jib, a mizzen was not offered as standard with this boat, but it is possible to add one if desired. There is a well on the port side that allows for a small outboard motor to be kept permanently mounted if desired. 14' 9" (4.5m) 5' 8" (1.7m) 280lbs (130kg) 100 sq ft (9.3 sq m) 1980 - 10 ? A stretched version of the Peterboat 4.5m. A nice looking double ended open boat, with ample performance and a good sized rig. The Peterboat 5m has a performance and speed advantage over the Peterboat 4.5m, a bit more onboard room but not a lot of extra weight, very useful when trailer sailing. Only built in wood, not GRP. The Peterboat 5m is a small boat that�s ideal for inshore or estuary sailing and the ability to tackle a little more adventurous sailing in the hands of a competent and experienced sailor if the conditions are right. 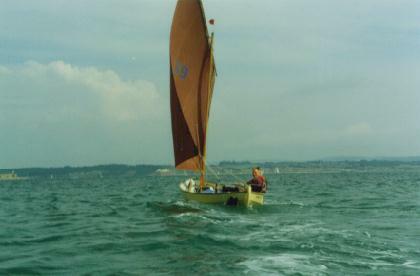 Ideal as a day sailer for trailer sailing with a small family, or single handed sailing. 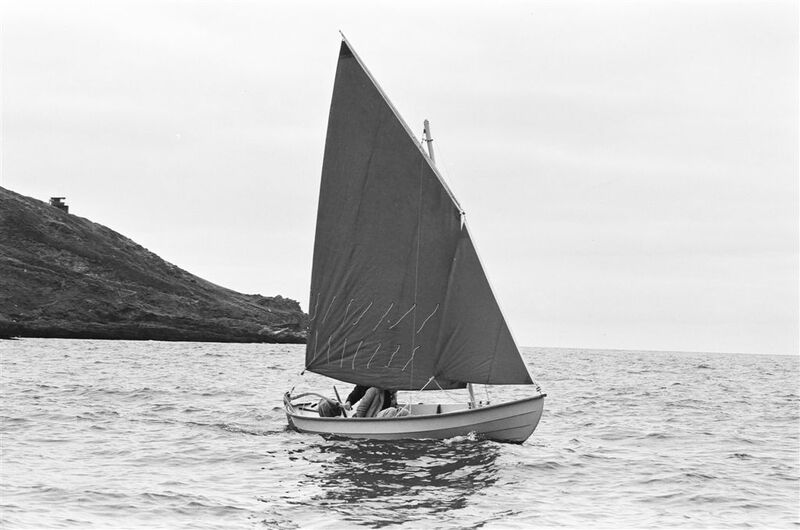 In common with the Scaith and Peterboat 4.5m she has a galvanized pivoting 28lb (13kg) centreplate to add ballast, a stern hung folding rudder and the rig consists of a simple standing lugsail and jib on a stayed mast. There is a well on the port side that allows for a small outboard motor to be kept permanently mounted if desired. 16ft 3in (5m) 5' 9" (1.7m) 340lbs (150kg) 120 sq ft (11.16 sq m) 1980 - ? 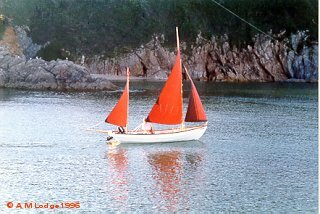 Initially designed as a Drascombe with higher performance, the prototype was claimed to be capable of 13 knots is a �Good blow�. A powerful double ended hull that was flush decked with a self draining cockpit. The boat was later modified to take a low coachroof similar in style to the Longboat Cruiser to allow better height and comfort in the cabin. Still a shallow draft hull, ballast is a 300lb cast iron centreplate using a winch to raise and lower it. The original Peterboat 6 metre had no permanent mounting or well for a motor, but later versions were adapted to take an outboard motor. Only built in wood, not GRP. The original rig was a large mainsail on a curved gunter yard and a big jib/genoa on a single mast, there is a stern hung rudder. A very beautiful looking boat in the original guise, with a stunning performance. Well capable of adventurous sailing in the hands of a competent and experienced sailor. Ideal as a day sailer or for extended passages, but a bit heavy for regular trailer sailing. Later boats were adapted to take a variety of rigs and also had a redesign to make construction a little easier. 19ft 6in (6m) 6' 6"? (2m ?) 1800lbs (818kg) varies 1979 - ? 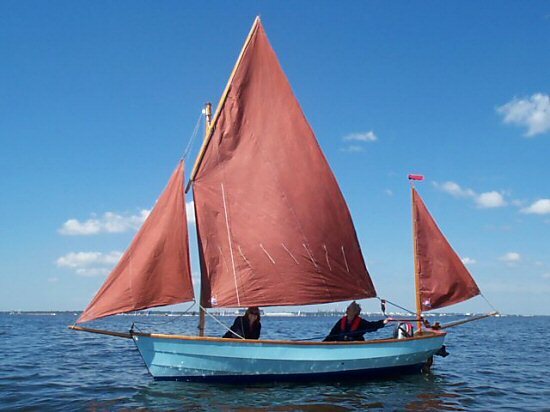 Designed as a low-cost Drascombe for single-handed sailing, the Scaffie has no centreplate, relying instead on water ballast and two deep bilge keels. Rig is a single standing lugsail. 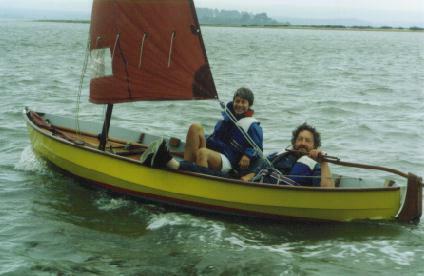 A double ended open boat, designed as a big brother to the Skiff but with more beam, length and freeboard. Only built in wood, not GRP. The Scaith has good sea keeping qualities combined with a decent sailing performance, a boat suitable as a day sailer for trailer sailing with a small family, or single handed sailing. A galvanized pivoting 28lb (13kg) centreplate adds ballast, there�s a stern hung folding rudder and the rig consists of a simple standing lugsail on an unstayed mast in standard guise. Customised options offered a raised foredeck and the mast stepped in a tabernacle. 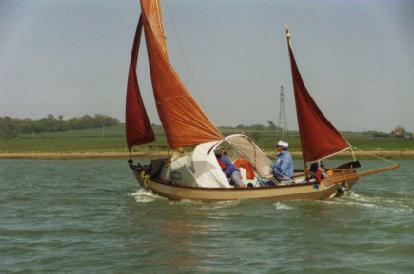 Additionally there�s the option to add a small jib or even a jib and mizzen to give the distinctive three sail rig associated with Drascombes, the mizzen mast and bumkin is offset to starboard to keep it out of the way of the well on the port side that allows for a small outboard motor to be kept permanently mounted if desired. The Scaith is an attractive boat and the forerunner to the Peterboat 4.5m. 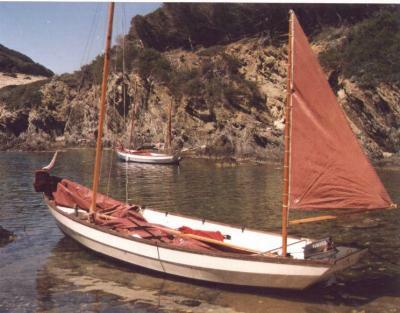 A double ended open boat, designed in 1970 as a small boat to fill the need for a boat that would row well, sail well and be easily pushed along by a very small outboard motor. Most boats do one or the other, but rarely all three. 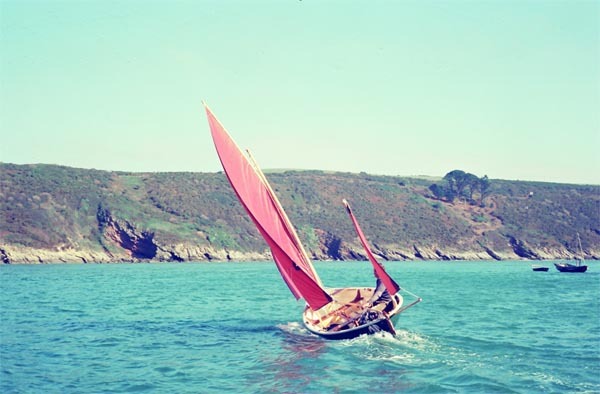 The Skiff carries a small standing lugsail (jib is optional) a dagger board and rudder to give a versatile small boat that could very easily be trailed and sailed single handed. The mast is unstayed which makes preparation for sailing very quick indeed. A mini transom allows a small outboard motor to be mounted when the rudder is unshipped. Later modifications to the wooden Skiffs included a pivoting centreplate as an alternative to a dagger board. A delightful small boat to sail, ideal for creeks, rivers and estuaries. 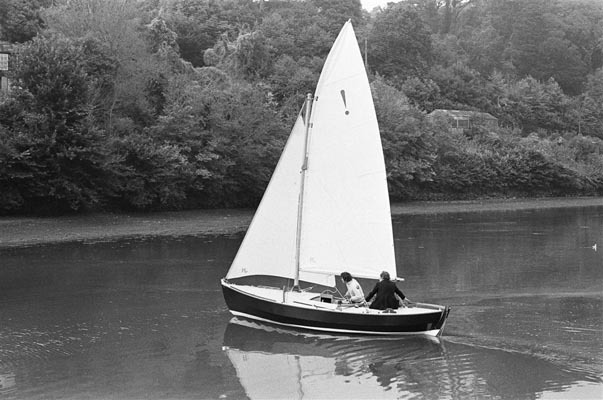 John Watkinson built the prototype and the next two boats at Drascombe Barton, with production of all subsequent wooden boats being undertaken by John Elliott Boatbuilders. Around 30 were built in wood at their yard all by Douglas Elliott. A GRP version was produced in 1996.